I think it is appropriate that Remembrance Day has been for the most part turned into a holiday. Although I notice that both the US and Canadian stock markets are open. I guess greed takes no holiday. My bigger concern is that as we are now an entire generation removed from the last world war, many of us forget to remember. The price for our freedom today has come at a very high cost. In WWI 66,665 Canadians lost their lives. On the battlefronts in France and Belgium, it was Canadians that decided the final outcome of the war. The victory of Passchendaele Ridge in the autumn of 1917 alone cost 16,000 Canadian casualties. We have only one surviving WWI veteran still living. 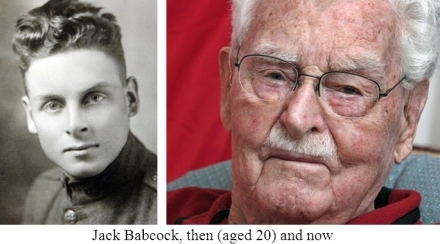 John Babcock is 109 years old and living in Spokane Washington. In WWII Canadians were again instrumental in deciding to final outcome. 46,998 lost their lives and 55,000 were injured. We are grateful for the American contribution which tilted the odds in the Allies favour, but they never joined in active European conflict until 1943. Canada had been there since 1939. It was Canadian troops that liberated Holland in May 1945. There is a war monument on Winnipeg’s Memorial Blvd. that says,” They gave their tomorrow, that we might have our today”. I am anything but a warmonger, but I am concerned that this generation’s desire for a conflict-free world makes them indifferent to the price of peace. Jesus himself said, “Greater love has no one than this, than to lay down one’s life for his friends.” John 15:13 Those who have fought and died for Canadian freedom have demonstrated the ultimate expression of biblical love. Enjoy your day off. But please, please remember to remember.